My name is Jane Howatt. Welcome to my blog! For 13 years I rode shotgun with John “Jigsaw” St. John, one of the LAPD‘s most celebrated detectives, as he investigated notorious murder cases. 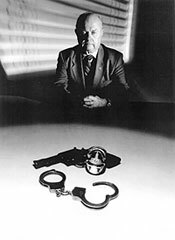 On my blog, I‘ll post about true crime, my life and what I learned from the mind of a brilliant homicide cop. I invite you to join me for the ride! It was never my intent after spending 13 years riding alongside Detective John “Jigsaw” St. John to receive letters from publishers that told me they didn’t like my story and they didn’t like my writing and they didn’t think my book fit their list and they already had a book like mine. I never felt riled up enough to jump on top of our dog’s doghouse and yell to the New York editors who turned down my manuscript, “You dumb brick heads! Can’t you see this is a masterpiece!” But I sure felt Peanut’s pain. For all you writers out there who pound keys day and night dreaming of the magical day you get a call from your agent telling you your baby has been delivered, I am one of you. I’ve gone to the conferences and listened to the guest speaker talking about his/her new life as a published writer. I’ve walked past the freshly printed stacks of books piled high thinking – someday! Someday! I finally had the nerve to measure my stack of rejection letters. All totaled: one-and-a- half inches. That’s a lot of rejection letters. But you know what? I don’t think of them as rejection letters anymore. When I read them I realize that during the time I was pounding keys and dreaming of the day my book was on the bookshelf, something else was happening. I was slowly, ever so slowly, mastering the craft. The words I wrote one year ago were horrible! I deserved those letters. Any publisher who would have published what I wrote when I first started sending them my work would have received his termination papers. The road to publication is a struggle. It’s filled with pot holes and fits of temper and a few tears. But don’t give up, whatever you do. Do not give up. Or you will perish. And your brilliant baby will never see the dawn. This entry was posted on Thursday, December 3rd, 2009 at 9:19 pm	and is filed under In The Beginning. You can follow any responses to this entry through the RSS 2.0 feed. You can leave a response, or trackback from your own site. I created this fund in honor of the late LAPD’s Badge No. 1 and my mentor, “Jigsaw” John. This scholarship will provide college tuition assistance for a student who wants to pursue a career in law enforcement or criminal justice. A portion of the proceeds from the sale of “The Killer, the Cop and Me” will be donated to the fund. Donations may be made through the Boys & Girls Club of Ventura County online donation page.